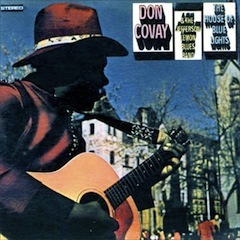 Released in 1969, The House of Blue Lights was Don Covay’s bold, adventurous attempt to reach an underground audience. Here Covay is backed by the white-hot Jefferson Lemon Blues Band, credited on the album jacket. Prior to this LP Don Covay released two of the finest soul/pop albums of the 60’s, Mercy! and See-Saw. The House of Blue Lights is considerably different than what came before. Most of the record is grounded in electrified country-blues; a deep Southern, swampy aura dominates the proceedings. No soul man of the time tried any blues like this before: raw, anguished and lived-in with lots of twangy guitar solos for good measure. A few of the numbers, namely the title cut parts 1 & 2, maintain a moody organ-led soul sound that’s highlighted by light sitar flourishes. These lengthy tracks are clear standouts but other cuts still have the power to stun and amaze. In the beginning “Mad Dog Blues” hit me like a ton of bricks. This tune begins with Covay (and band) barking like dogs in heat. It also features a fantastic flute solo and stinging lead guitar work; play this one LOUD for best results. “Four Women” is more of the same, Covay’s smooth, soulful vocals complimented by crunching electric guitars and a rocking beat. Most of the album’s tracks are originals but a few covers are worth mentioning. Consider the old country-blues standard “Key To The Highway,” Covay manages to breathe new life into this classic warhorse by adding muffled vocals and electric back-porch-blues guitar. Great article. Great music. Great. love Don Covay but never heard any of his albums, especially none of this looser bluesy stuff. thanks for this!